South Carolina coach Dawn Staley typically travels in the summer, but rarely on a trip like this. The Gamecocks' women's basketball coach is on a 10-day visit to Africa with President Bill Clinton and his daughter Chelsea. They are part of a delegation assembled to see the progress of projects initiated by the Clinton Foundation. ''Each day is an eye-opening experience for me,'' Staley wrote in an email to The Associated Press. She was asked by the WNBA to join the trip as their representative and jumped at the chance. Staley said she has visited people in Malawi on a farm site that teaches them how to add protein to their diet. In Zambia, Staley toured several Clinton Health Access Initiative clinics in rural communities with Chelsea Clinton. In Tanzania, Staley saw the foundation work with Barclays to bring banking services to people without such basics. ''For the rest of my life, I will be able to tell people what it's like to witness someone hearing for the first time or to let them know what it's like to watch people drink clean water and how we can learn to appreciate the small things in life that we sometimes may take for granted,'' Staley wrote. Staley attended a soccer match in Zambia where those attending could be tested for Malaria. She also gave out soccer balls donated by South Carolina women's soccer coach Shelley Smith. Among the highlights for Staley was interacting with the Clintons. She had met President Clinton before as part of the U.S. Olympic team that won the 1996 gold medal in women's basketball, the first of three golds Staley would earn as America's point guard. This time, though, Bill Clinton twice sat at her dinner table and the two shared stories of their lives. Staley believes her time in Africa will have a lasting impact on her players, one as important as any skills camp or shooting drill. She's seen people and areas that are far less fortunate than many areas in the United States and hopes to share that with her players, stressing the need to finish their degrees and give back to those in need. ''I consider all of these experiences teaching moments,'' she wrote. It's been a busy offseason for Staley after a successful year on the basketball court. The Gamecocks finished 25-8 and won a school-record 11 Southeastern Conference games. South Carolina reached the NCAA tournament for a second straight year, something it hadn't done since the 2002 and 2003 seasons. 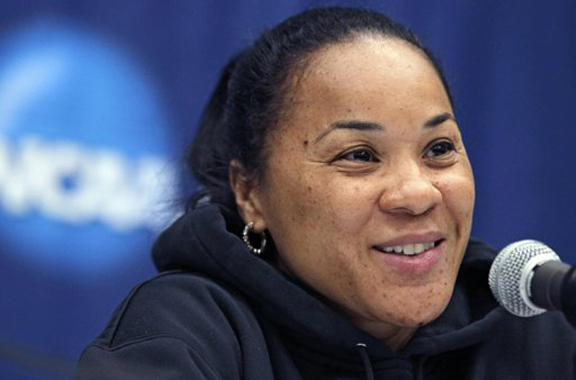 Staley turned down an inquiry from Ohio State about its women's basketball opening, accepting a three-year contract extension that included raising her compensation package to $850,000. In April, Staley was among 12 people voted into the Naismith Memorial Hall of Fame. The induction ceremonies will be held next month. Staley said her highlights were in Zambia watching a child hearing for the first time after getting fitted with a hearing aid - ''I will never lose that image,'' she wrote - and in Rwanda when they learned of 10 critically ill children in need of medial help and the delegation pledged the money to provide the care. Earlier this summer, Staley organized INNERSOLE, a movement to provide new sneaker to school-age children in need. She received over 850 pairs at a kick-off drive in June and has plans for other events when she returns later this week. Staley didn't have time for any basketball on the visit, she said, although she did post a photo of herself and actress Dakota Fanning in front of zebras last Friday in Zambia. And while President Clinton was the tour's big draw, Staley got noticed, too, when the group arrived a hospital in Rwanda. One of the Clinton Foundation staffers there grew up a fan of Staley's hard-nosed basketball style and couldn't believe it when the six-time WNBA all-star walked in.